Did you know that the Alpes-Maritimes département offers one of the largest wilderness areas in Europe? They include many protected areas, a wealth of biodiversity unequalled in Europe, exceptional landscapes and the presence of most of the large wild animals of Europe. • Complete privileged tour of Centre Alpha with a qualified guide. Meeting with and observation of wolves. Observation of large alpine fauna while hiking in the heart of the Park. • From the highest peaks to broad plains, surprising, fascinating environments. • Observation and photography of wild animals in the protected area of the Monts d’Azur Reserve. • Visit with a guide from the Reserve on foot and in a horse-drawn carriage, to see deer and bison up close. • And also in the Mediterranean Sea, with the Pelagos Marine Sanctuary, a protected area for observing wild dolphins, sperm whales, sharks, turtles… A discovery tour from a boat. 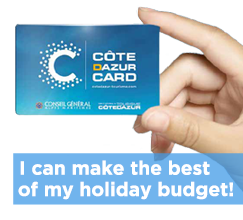 • Privileged private tours of zoological centres (Centre Alpha with wolves in Le Boréon, Monts d’Azur Reserve and bison) and the Pelagos Marine Sanctuary (dolphins, sperm whales, sharks, turtles...). 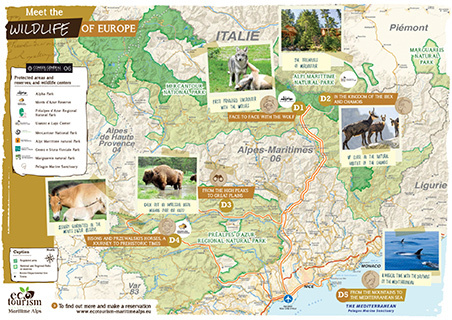 • Observation of large European mammals (bison, wolves…). • Immersion in exceptional protected natural environments (Mercantour National Park, Reserves and Marine Sanctuary) in the company of a specialized guide. • Privileged specialized monitoring to facilitate discovery and observation of the animals. • All the treasures of a region between the sea and mountains. • Original quality responsible accommodation. • Complete quality private services. Short stays possible on request. Other stays in preparation for autumn: in particular a cycling stay, a stay around horseback riding and several multi-activity stays.